Happy Halloween! Hope you are all having a spooktacular day! This is a yummy and healthy recipe to spice up an autumn dinner. I made this the other night, and it was delicious. There are flavors in this dish that I would have never thought to pair with squash. It's so creative, wish I had thought of it! I found this recipe in Guy Fieri's cook book called Guy Fieri Food. Hats off to Guy Fieri for giving me another way to spice up autumn flavors! This is for little ones 10+ months who are ready for finger food and Mommies and Daddies of all ages. To make turkey sausage, in a medium bowl, combine the thyme, sage, salt, and pepper. Add turkey and mix well, cover and refrigerate while you roast squash. To prepare the squash, preheat oven to 375F. Trim the ends off the squash so that it will sit flat. Scoop the seeds and membranes from inside the squash. Place the squash halves cut side up on a baking sheet, drizzle with 2 tbsp of the olive oil, and sprinkle with 1 tsp salt and pepper. Place the squash in the oven and roast for 30 to 35 minutes, or until golden around the edges and a knife can be inserted easily into the flesh. Remove from the oven but leave the squash on the baking sheet. Heat a large skillet over medium-high heat and pour in the remaining 1 tbsp of olive oil. Add the turkey, making sure to leave large chunks, about 1 inch across. Let the chunks brown, then turn and cook through, 8 to 10 minutes. Transfer to a plate and keep warm. In the same pan, melt the butter over medium high heat. Add the cabbage and cook until it starts to wilt, about 4 minutes. Add the peppers and onion and cook for 6 to 8 minutes, until the onions are soft and the peppers are still a little al dente. Add the turkey and the garlic. Cook for 2 to 4 more minutes to blend flavors. Add salt and pepper if necessary. Turn the oven to low broil. Divide the turkey mixture among the squash halves. Crumple the goat cheese over the tops, place under the broiler just until the cheese is warm. Garnish with a bit of parsley, serve and enjoy! I can't wait to try this recipe. 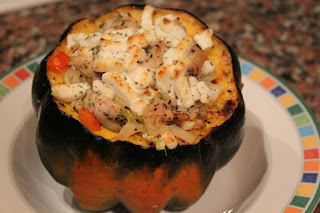 I have never fixed acorn squash and this looks so simple and delicious.